1. Make a project featuring "A Belly Band". 2. Or Make a project using "Twine". Now I wont lie, I had no clue what the heck a belly band was and had to ask. My fellow DT members explained it to me and I went "ohhhhhhh", LOL. I guess I have never seen one before, and if I have I didnt pay attention to it! I grabbed the DSP that I am currently enthralled with...Spice Cake! How beautiful is this paper? I am going to have to buy a bunch more of it and stock up for use throughout the year! I also MASHED it up and featured a belly band that also used twine! Make sure you head over to the Friday Mashup blog to check out all the inspiration from the rest of the design team and make sure you play along with us. 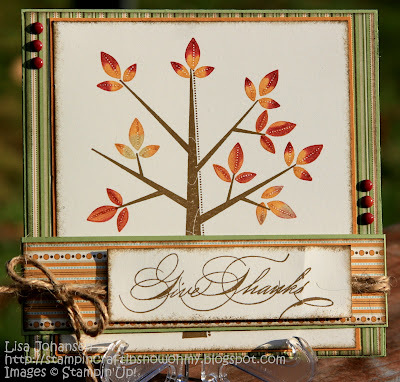 Great inspiration card, love the papers you've used. This is a beautiful, seasonal card! I love everything about this card!! The autumn colors, the layers...and your FABULOUS belly band!! LOL!! You totally nailed the Belly Band for not knowing what one was. I can honestly say I think I've only used one like 2 times in the 23 years I've been stamping so they really aren't that common. I love this tree with those colors!! Beautiful, I love the varied colours on the leaves. This is stunning Lisa, I love the warm rich colours on the leaves. Awesome card!